Most of them include a happy-hour burger — one with Wagyu beef, even. One thing though has remained tried-and-true: The burger is king, still usually the featured bar offering. Here’s six new happy hours around town. This Belltown bourbon bar comes from an unlikely source, the couple behind two Spanish bars nearby (Pintxo and Bar Abajo). They detour from the Mediterranean here to pay an homage to the Bluegrass State with hot fried chicken, shrimp and grits, and other southern comfort food, and all of it is $2 off during happy hour. 2219 Fourth Ave., Seattle, accessible only through Bell Street alley; happy hour daily 4-8 p.m. with $4 pints, $7 Makers Mark Kentucky Mules, $2 off on select cocktails and on food. No website but on Instagram. A new restaurant from the nonprofit FareStart is open in South Lake Union, one of five eateries that sit in donated space on the Amazon campus. Salmon poke and charred Shishito peppers are served during happy hour, along with the usual bar staples (wings, burgers and fries). 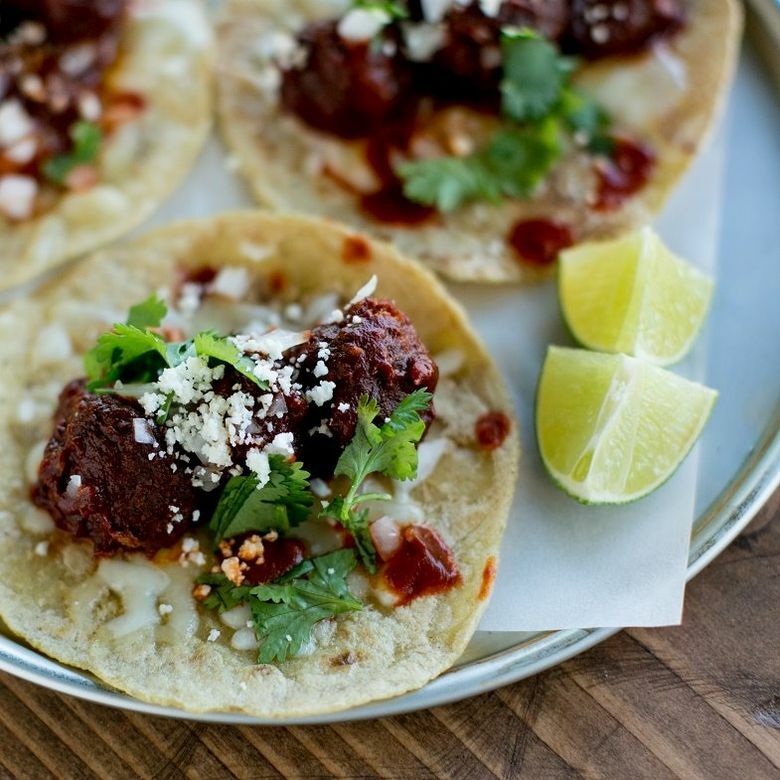 This gourmet taco-and-agave bar, located north of Gas Works Park, comes from the same restaurant group that brought Barrio to Capitol Hill and all those Purple Cafe & Wine bars to the masses. There’s fusion tacos ($4-$5.50) that range from pineapple-and-bacon to a spin on banh mi. During happy hour, there are $8 margaritas, but the $6 michelada with your choice of Mexican lager is the way to go. The new grand restaurant around Amazon campus, 2120 sits near The Spheres. It’s packed during lunch, but like everywhere around campus, the crowds disappear after the Amazon busy bees punch out. That’s why bars and restaurants around Amazon have the most generous happy hours. Here, there’s fussy bar food such as mac and cheese with duck-fat croutons, and the popular Wagyu burger (with bacon, avocado, manchego cheese and chipotle). The best thing, though, is the grilled octopus atop a carrot-honey puree, corona beans, sofrito and sherry gastrique. New owners are fancying up the food at this Seattle institution but this is still Belltown, so there’s happy hour, including a $12 signature burger. Like many of the city’s acclaimed chefs, Ethan Stowell has bought in to this happy-hour game. His 16th restaurant is located within The Shop, a car club in SoDo. You get a view of luxury and classic cars while you munch on wings and poutine, and sip $6 cocktails. For seafood, there’s crudo and oysters. And of course, there’s always the happy-hour burger.